One week you're a hero: On March 28, a New York-based colt named Quality Road wowed the racing world with a powerhouse victory over Todd Pletcher's highly-regarded contender Dunkirk in the 2009 Florida Derby at Gulfstream. Kentucky Derby, here they come! Ten days later, you're looking for a hero. Quality Road has found one: Ian McKinlay's black Suburban has been parked in front of the big colt's stall at New York's Belmont Park. 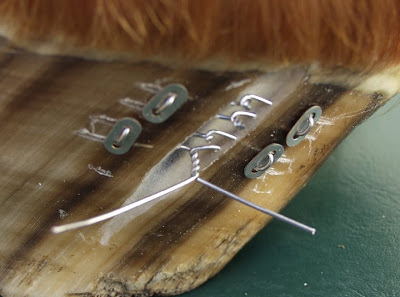 The noted hoof repair specialist--neither veterinarian nor farrier but a critical consultant to top racehorse trainers--got the call from trainer Jimmy Jerkens to work on a crack in the inside quarter of the colt's right hind hoof. McKinlay said this afternoon that the crack popped during the Florida Derby and was patched before the horse shipped back to New York, but that inflammation under the Florida patch had Jerkens looking for some help, and New Jersey-based McKinlay was soon on his way to the track. McKinlay said he pulled off the old patch, cleaned up the crack, laced it with stainless steel sutures and applied a drying agent. He left the crack "wide open" so it would dry and said that the horse galloped today and was sound, but they were waiting for it to dry up. "We should be able to patch it, possibly by the end of the week. The whole thing should be over by this weekend and he'll be on his way...or else my reputation will be shot!" McKinlay said, half joking. Jerkens is a popular New York trainer who would carry a lot of sentimental support with him when and if his horse makes the scheduled April 28th departure date for Kentucky. McKinlay said that the cracked hoof had been shod with a bar shoe to stabilize it but that Quality Road will be back in a regular shoe once the patch is applied later this week. He repeated several times that he did not think that this crack would affect the horse's trip to Kentucky or his chances in the Derby, barring unforeseen complications. "This is no Big Brown type of situation," he said more than once. Last year's Triple Crown news was headlined by McKinlay's work to help that colt through wall separations on both front feet and then a pre-Belmont quarter crack that may or may not have been too much for the champion. Something was, as he failed to run his race in the Belmont Stakes and did not win the Triple Crown in spite of patches on patches and designer glue-on Yasha shoes that have been successful for other horses and had helped him win the first two legs of the Triple Crown. Quality Road is a very big colt; he is a Virginia-bred son of Elusive Quality and is owned by Edward P. Evans. He set a new 1 1/8-mile course record in 1:47.72 at Gulfstream with his Florida Derby win. Pletcher complained after the race that the track was too fast and that he wouldn't have run his horse if he had known how lightning fast the track would be. Quality Road may have paid the price for an exciting race and a new track record. Let's hope Ian McKinlay is right and this is a minor setback for a horse that--if he's sound--can help make this year's Triple Crown series exciting. Click here for stories and video of Ian McKinlay's technique for quarter crack repair. Click here for an overview of quarter crack repair. Click here for an article about Big Brown's pre-Belmont 2008 quarter crack.